Most of our arrivals in India we at night after a significant day of travel. Jaipur was no different. In that way. In every other way it was like going to a completely new country. 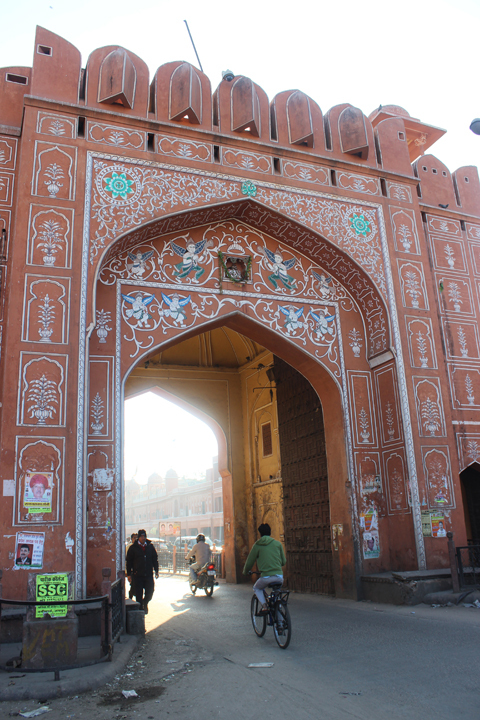 Our first morning was to be a ride into the Pink City to check out the spice market and other shopping possibilities. The City of Jaipur is walled with 9 gates. To get into or out of the city you must go through these enormous gates. The actual doors are probably over 20 feet high and at about the 10 foot mark they are fitted all the way across with giant spikes protruding about 2 feet each. These are not razor sharp thin spikes but thick and round, maybe 6” in diameter and they certainly come to a point. Today they are mainly decorative but during other times in history they were intended to deter elephants from storming the gates to enter the city uninvited, presumably with warriors and weapons along for the ride. The city itself is indeed pink. More of a pinkish terra cotta color and there is a reason for that too, of course. When Prince Albert was coming to live in the city, thousands of roses were ordered from Pushkar, a 6 hour car ride away. The problem was over one hundred years ago there were no cars so by the time the roses arrived by horse or ox or camel, they were dead. What to do? They painted the city the color of the roses to honor him. Every year they repaint the entire city.